It’s easy to download Spotify music with Premium subscription, but it will cost you $9.99 per month. Besides, you can only download Spotify music on 3 devices, with up to 3,333 songs per device. The songs downloaded are DRM protected and you can only play them on that device with Spotify app. However, if you can get a streaming music recorder that allows you to record Spotify music to plain formats, you can also save the Spotify music and play them anywhere you want. Here we will introduce you 2 free Spotify recorders which allow you to record Spotify music to mp3 or wav. The two free Spotify recorders are Free Sound Recorder and Streamosaur. Free Sound Recorder from CoolMedia can record any sound that comes from your computer’s sound card, so you can play your favorite Spotify songs and use it to record. 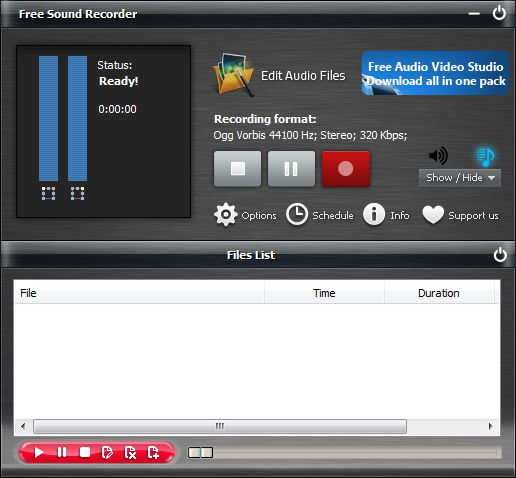 Free Sound Recorder runs on Windows XP or higher and can record Spotify music into MP3, OGG, WMA, and WAV audio files. 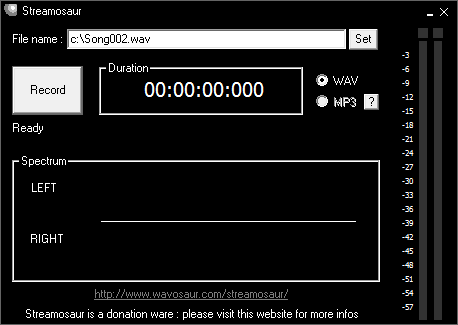 Streamosaur is a real time direct to disk recorder software for Windows XP and Vista. It also record all sounds from your sound card inputs. Click the Record button and then play your Spotify music. It support 2 output formats: WAV and MP3. The above 2 Spotify recorder are both free and easy-to-use, but they can’t get ID3 tags of the recorded song and won’t recognize individual songs. Also it reqiures you to start and stop the recording of each songs manually. This is sufferable when you just want to record several songs. If you want to record a large number of songs, this will be very time-consuming. 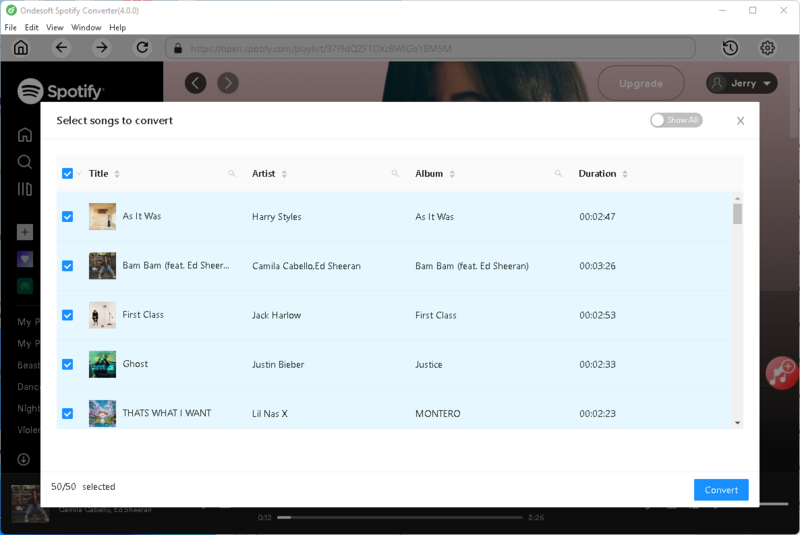 To record as many Spotify songs as you like quickly and easily, you should try this paid Spotify music downloader - Ondesoft Spotify Music Converter. It worth the money. Tutorial: How to record a large quantity of Spotify songs easily? 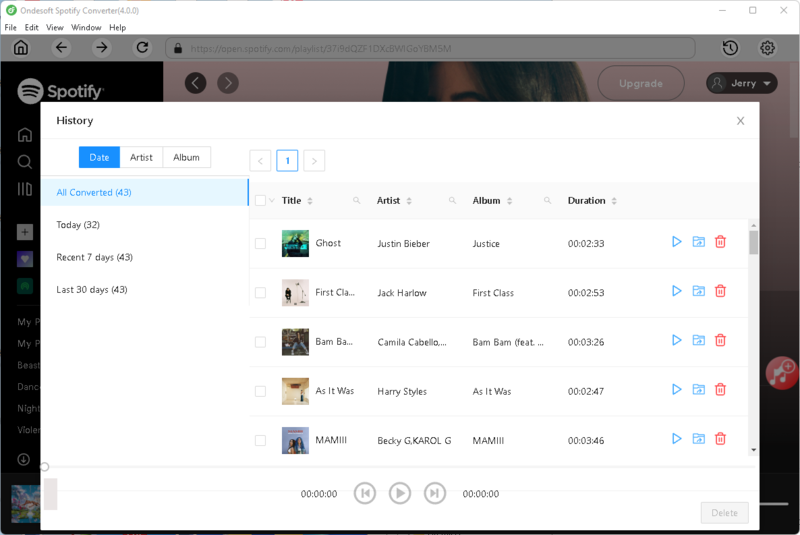 Ondesoft Spotify Music Converter is an excellent Spotify playlist downloader which allows you to easily record Spotify songs/albums/playlists to MP3 with either Spotify free or premium account. The conversion is fast and will preserve all ID3 tags. Follow the steps below to easily record Spotify to MP3, M4A , WAV or FLAC with high quality. 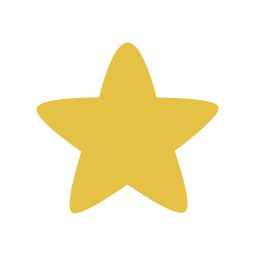 Download, install and run Ondesoft Spotify Music Converter on your Windows. 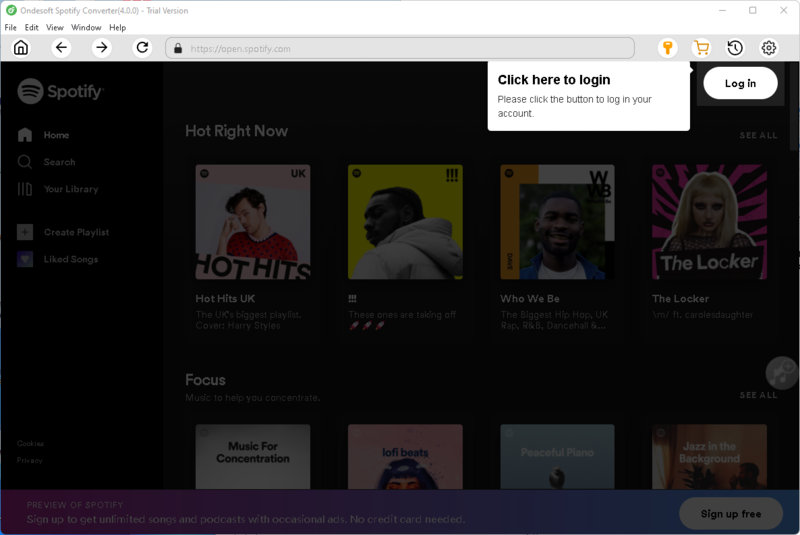 Method 1: Drag songs, playlists or albums from Spotify app to the interface directly. 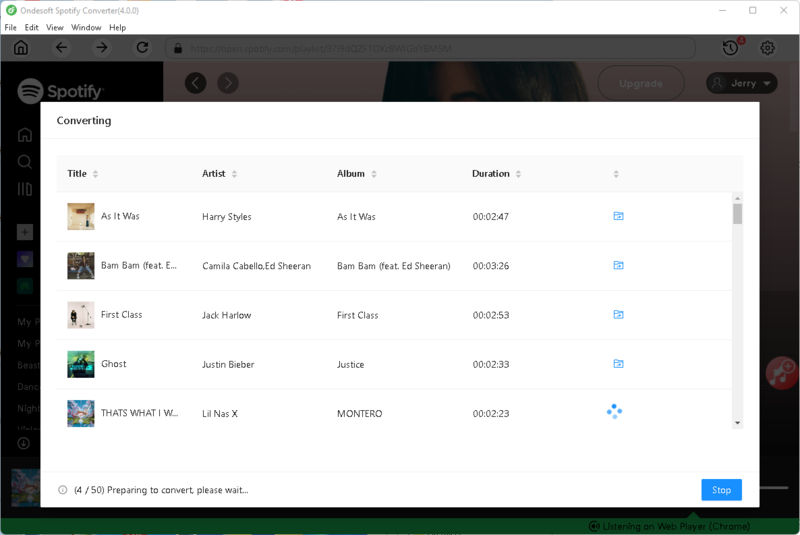 You can also uncheck the songs you don't want to convert on below window. You can add as many songs, albums or playlists as you want. Then click Add. Method 2: Click "Add Files", copy&paste the link of the song, album or playlist from Spotify app to the bottom area. And then click Add. 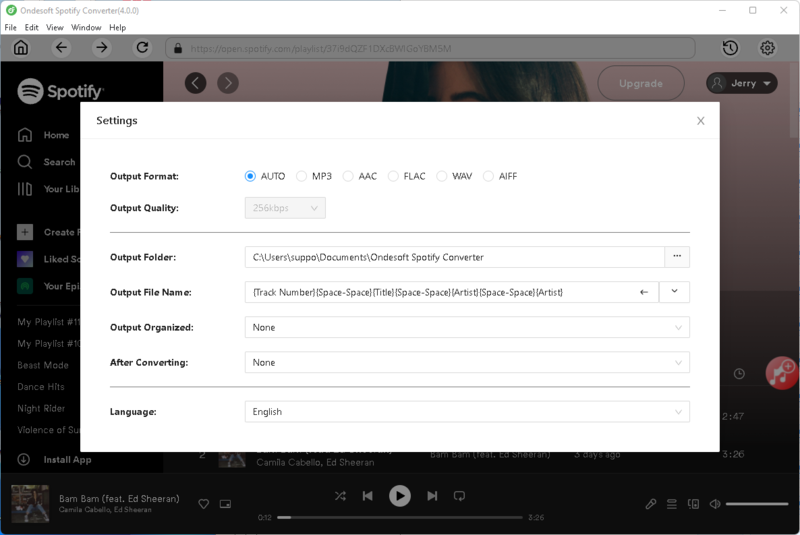 Ondesoft Spotify Music Converter will show the song artwork, title, artist, duration and output format on the interface. Besides converting Spotify Music to MP3, it also supports converting Spotify Music to M4A, WAV, FLAC. Click Option button to change output format or output folder if you need. You can also change bitrate, samplerate according to your needs. Click Convert button to start recording Spotify music to MP3. The 100% original quality and ID3 tags will be preserved to the recorded DRM-free songs. After conversion, click below folder icon to quickly locate the DRM-free Spotify songs, albums or playlists in mp3 format. You can then transfer and play them anywhere.